I'm thinking about the possibility of getting an X-Box 360. I've wanted to play a few games recently and my beast of a laptop can't quite cut it. It'll add up as i'll need a new TV too (April will never let me play all night downstairs), this all pushes into the £750+ bracket which would eat into my new laptop in May fund. The lovely chap that Kris is, is going to let me borrow his next weekend so I can give it a trial run. Then I had a look at what operating system he was using. Windows Vista. Ha, ha! I got home from work tonight to find a failed delivery notice from the Royal Mail. It's for my new phone and because I wasn't there to sign for it I must go and collect it at the sorting office. Looking at the back it says that the opening times are 7am to 5:30pm. Great, i've missed it tonight but i'll be able to get up 30 mins earlier and pick y shiny new toy up in the morning. I walked to the post office this morning at around 7:15 and it was shut. The sorting office opens at 9:30! Argh!!! Idiots! I'll be contactable from tomorrow now. A chest of drawers, a new coffee table and a bookshelf / entertainment stand. What was supposed tocost me £100, it's now costing me the best part of £300. We had Molton Brown at work last night, they're trying to sell there wares with a slight discount on the run up to Christmas (I know, nearly 2 months away but I won't go into that rant just now). I had a quick look to see if there was anything I could get April / Mum, but it was mostly large gift sets which were selling for a minimum of £50. There was free wine and nibbles however so I made the most of that before heading off to see Steve over towards Waterloo in a Shepherd Neame pub (South Eastern chain of real ale pubs), the Rose and Crown. I had a handful of beers and headed home, picked up a Chinese takeaway and watched Match of the Day. Not a bad impromptu evening really. I've now done one month in the new job. So far so good and all that. Just watching the 2nd new Spooks on BBC (April's a big fan) and it's got me thinking. I would never make a spook. I'd have to stop the blog for a start. Plus of course the fact that i'm a major gossip queen, as soon as I found out any juicy national secrets i'd be blabbing them to the first person I saw. I've just ordered a new phone through Vodafone. I'm getting the Nokia N96. I had the N95 and it was an excellent phone (until it broke) so i'm really looking forward to it. I should get it over the next couple of days. I was going to follow Kris' advice and go with 3 but looking at a handful of reviews online they have pretty poor customer service. I've had a lifetime of terrible customer service woes recently with Carphone Warehouse so I just don't want to risk it. The deal's virtually the same so i'm not massively fussed. From now on today shall forever be called F'You Carphone Warehouse Day! After much pain and anguish I have finally been given my PAC code so I can port my number and never pay the evil company any more money. I bought a pumpkin today, a nice big fat one, a picture will shortly follow. 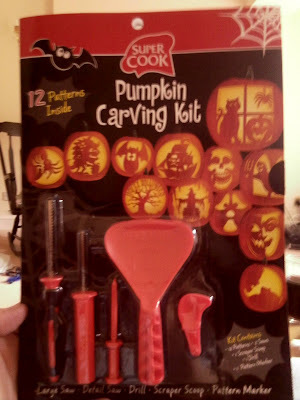 Next to the pumpkin shelf there was a pumpkin carving kit. It was only £2 so I thought what the hell. At the check in counter the poor girl got confused as she thought she needed permission for her supervisor to sell me orange juice. 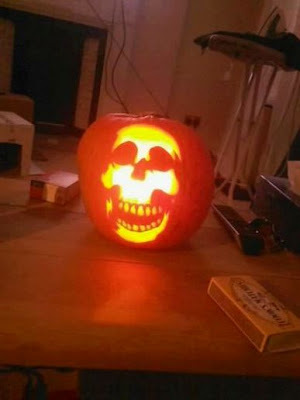 When the supervisor came over it turned out that it was for the pumpkin carving kit. Being under 18 she wasn't authorised to sell it to me. Bloody hell! What self respecting hoodie would be seen dead trying to stab somebody with an orange pumpkin blade? Anyway, here's April's handy work. Not bad eh? It wouldn't start this morning. The car turns over but not quite enough juice to start the engine. A drained battery perhaps??? But that totals the amount of knowledge that I know about cars. We opened the bonnet and couldn't even work out what part was the battery. Luckily, we have a years warranty that came from the Mazda garage so someone will be round within the hour. This afternoon’s dragged so much. Tick, tock, tick tock. 3 0mins to go. I've done all my work but my boss (') have been away all day so i've got nothing left to do. At least at Gallaghers I would have had 3-4 pints inside me to keep me entertained…I’ve been virtually tea total here. I'm off to see this with Steve, Jenny and April in December. featuring Ricky Gervais / Robin Ince / Richard Dawkins / Stewart Lee / Chris Addison / Ben Goldacre / Mark Thomas / Simon Singh / Josie Long / Justin Edwards / Martin White Fax Machine Orchestra It was pretty expensive but should be good. I was flicking through TV channels last night and watched a few minutes of the new Terminator: Sarah Connor Chronicles. And look who I spotted. One of the new characters was no other than the lead singer from Garbage. Well I never. What will those crazy Americans think of next??? Who stole my cat's hands? Our pay slips have just been handed round so I took a look at how much i'll be getting on my first pay day (Monday). He, he, he! The last month has been tough as i'd used up too many holidays up at the last place (pro-rata) so they took £400 off my final months salary. Coupled with that I also had to go to another wedding (2 nights in a hotel) plus I had the trip to Spain (which didn't turn out to be that expensive but it all adds up). Anyway, he, he, he! This month i've been given an extra £1,200!!!! It should reduce next month as there are no pension contributions this month but he, he, he! I will be a good boy and pay off a load of credit card debt, but as a special treat, i've told April she can buy a chest of drawers with some of it. I had to entice them in with treats but they now like it. I like the Coen Brothers, I don't think they've made a film I haven't enjoyed. This is no exception. Great characters, great dialog, superb cast and a funny story to boot. A couple of gym staff find a CD full of sensitive CIA data and try to sell it back to the owner. Trouble ensues in a complex series of interconnected stories. Brad Pitt is good, as is George Clooney. Francis McDormand is again excellent but the star of the show is John Malkovich. 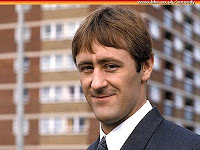 Is Stuart Pearce Rodney from Only Fools and H orses? I've found a worse Rock Band singer than Kris. Shaheen! The man has no tone, scrach that, he does have tone, just one type, monotone. Thanks for coming down guys, it was good to see everyone. 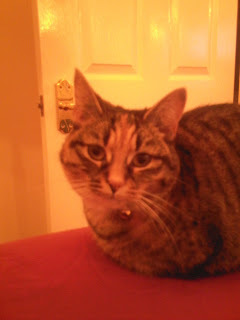 10 people + 2 cats stayed over which was a bit of a push but I had my own room with April so we were fine. I somehow accidentally slipped my Football Manager CD in between the gap between the cd drive and the laptop. It was stuck for about 15 minutes, and we tried everything, tweezers, unscrewing the base, eventually I managed to tease enough of it out to give it a good yank! It's free! And actually still works. It would have been a month without FM if i'd have broken it! The Clark-Parker household is now up to full compliment. April received two calls last night with the whereabouts of Biscuit. One call was to say that she was in a neighbours garden the other was from a nice family who managed to entice her into their kitchen and kept them for us till we got back. Other than hungry Biscuit seems fine, back to normal in fact. Poppet seems happier too. I think she really missed Biscuit. I started reading Robert Jorden's Wheel of Time series of books back in January. They're good books but at times they are a bit slow. Sadly he died before finishing the 12th and final books of the twelvilogy. Luckily Brandon Sanderson will finish the 12th book A Memory of Light, it's due at some point in 2009. They're each about 1,000 pages long and i'm currently halfway through the 6th Lord of Chaos. By my estimation, assuming the same rate of reading I will have finished the 11th book on Sunday the 2nd of August 2009. Hopefully, the last book will be ready just in time for me to read it. Saying that, I can't see myself buying a hardback version so I may have to wait a little bit longer. Operation letter drop had a major success this morning. We got a call from someone this morning whilst April was in the bath. Someone on The Drive (street that backs onto our back garden) said she was in her garden at that very minute so we ran over with fishy treats. We saw her but she must have been scared and she went into another garden. Bloody little thing! I printed out a load of colour leaflets with Biscuit's photo on earlier today and we've just posted about 100 of them. Hopefully someone will call. We've also phoned the people who store the microchip data and have reported her missing. She'll turn up soon. 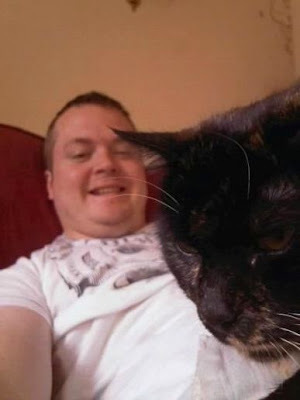 The bloody stupid cat! I thought i'd try something different this morning and made myself a Jasmin tea. Yuk! I don't like Jasmin tea. Our friend who was feeding them over the weekend whilst we were away on holiday last saw her on Sunday. I hope she's okay. We've been out looking for her but no joy. She may have been in but the cat flap's been set to in and out so we just don't know. Now cats can only get in. Hopefully when we get home from work tomorrow the silly little cat will be back home. I found the stationary cupboard at work today so have acquired myself a couple of pens. One of them is a Gel Grip pen. Other than writing, having the lid stay on the top of the pen is one of key design points, otherwise there is an increased likelihood of losing said lid and drying out the ink. Or maybe that’s deliberate, they want you to be replacing your pen more often. We saw them randomly at the Crobar (see earlier posts) and were excellent. Hopefully they'll have changed their set. -'The dog, called Asbo' :- what the fcuk! -'The men were trying to hit the dog with a fire extinguisher' :- because that's handy. Wasn't it holding a baby in it's mouth??? -'Eventually a man came on to the green in a pickup truck and tried to run the dog over' :- wasn't it still holding the baby??? -'The dog went berserk and started chasing the man in the truck down the road. ' : - the man was in a truck. What could the dog possibly do??? The owner should have been the one that was shot. I still have two cats. They've used the flap for a day now and they're still coming home, so we must be doing something right. Something must be right at my new company. The two cats are like Donner and Blitzen! We've had the cat flap fitted so April bought the cats a nice new belled collar each as they are now allowed outside and doesn't want them to catch any birds. I went out for lunch and a walk today and bumped into 4 ex colleagues, when I was at Gallaghers I rarely saw anyone I knew, unless I deliberately went out to see someone. This strikes me as being a very poor choice of location for my previous employer, half of all insurance business in the city is down to relationships and networking. If the office is no where near the real action you are always going to get less business. On top of that there were also two strip joints on the street too, one Incidentally called 'Bar Oops! ', there were three, but that got shut down as it was suspected of also being a knocking shop. Whilst April is at home studying today we're taking the opportunity to get a cat flap fitted in the side door of our house. Despite their best efforts of escaping, sneaking into our bedroom (the only room with the windows open) and tunnelling through the carpet. The cats have been locked indoors for nearly 3 weeks. Hopefully i'll still have two cats by the end of the day. An ex Lloyd's colleague invited me over to Newquay this weekend for his wedding. It was good fun but the timings could have been much better. We had to be there by 10:15 in the morning so this meant leaving Tonbridge on the Friday night and having to stay overnight in Exeter. It took us 4 and a half hours to drive back yesterday which is an excellent time but it's just tiring. I am shattered today and that's despite going to bed at just gone 10. Thankfully no more weddings for the rest of the year, it's a tiring and very expensive experience. I think we've spent over a grand this year, I can't see it being much less next year. I had an e-mail from the theatre where Eddie Izzard performing his London gigs yesterday and it mentioned that you could pre-book tickets now to avoid the masses and get in there first. Luckily he was in London on Ben's birthday weekend so I checked prices and e-mailed round to see who would be interested. Other than 'because he can' I don't know how he can justify £60. We saw him earlier in the year and he was funny, but not £60 worth of funy. I looked into going to see Steve Coogan a while back too and he was £50+. Obviously comedy is one of the few things to avoid the credit crunch. 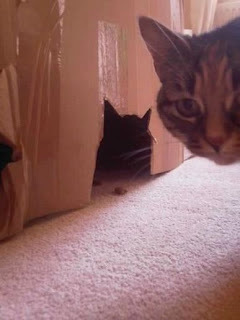 I think my brothers cats left a little present behind after their stay a few weeks back. I think they p!ssed on the door mat just inside the front door. Now our cats are taking on the problem buy spraying it themselves. Yuk! Apparently tea tree oil will put them off going near it but the house still stinks. Bloody things! Hopefully after we let them out of the house when the cat flap gets fitted next week they'll find other things to p!ss against. My first week at the new company has been good. -It's actually in The City rather than on the edge of the arse end. -The CEO of the managing agent (the guy who I had my fourth and final interview with) has just been promoted to CEO of the whole company.